Often viewed as a transition instrument between Dixieland banjo and swing guitar, the tenor guitar really has a sound and style of its own. It can be heard in country music, western swing, and jazz. Today, it is also finding a place in contemporary folk and pop music, as well as Celtic and other ethnic styles. 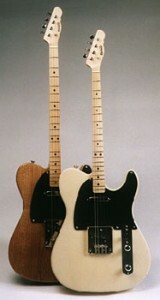 The electric tenor guitar is nothing new, but the TENORCASTER is a new combination of two classic American guitars, the tenor and the Tele. The standard Kent Armstrong Hot Tele pickups favor the low and mid range harmonics giving the guitar a big, fat tone, with plenty of twang if needed. The TENORCASTER has a 23″ scale that works well for standard tenor tuning (CGDA), octave mandolin tuning (GDAE), as well as guitar and other open tunings (26.25″ plectrum scale available at no extra cost). Available in ash or butternut, with a clear, tinted, or opaque finish.